Two years ago today, I hobbled into Saratoga hospital on my crutches, and would leave without the lower portion of my left leg. I had no idea how I would live or what I would achieve as an amputee. I was just banking on being relieved of the pain the leg caused. After six years of unrelenting pain, multiple surgeries and the inability to walk, I had to take the chance with amputation. I spent the first year making my body strong and capable without the leg. Being freed of the painful, useless leg was liberating, and I soon discovered that I was capable of accomplishing anything I wanted to in the gym. The more I pushed and challenged myself in the gym, the easier my daily life became. 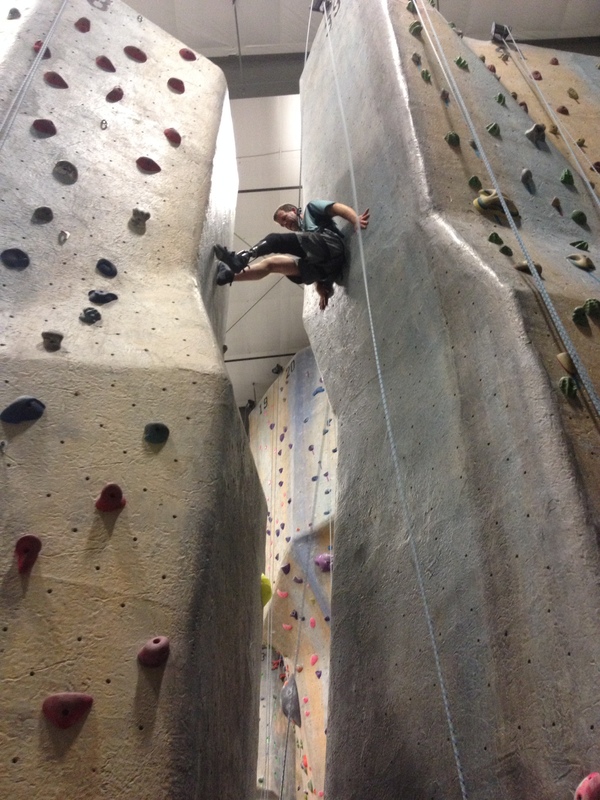 Outside the gym I took on cycling, rock wall climbing, returned to skiing and successfully completed challenging events such as the Warrior Dash. I also spent the year learning to walk with the prosthetic leg and manage it. None of it was easy, but with the right attitude, hard work and determination, I learned that amputation didn’t have to stop or define my life. In fact, I discovered that the human body is very much capable of adapting to physical change and accomplishing incredible things. I was living a full, highly active life despite losing a leg. Going into my second year, I became a full-time personal trainer. The most rewarding part of my fitness journey has been having the ability to inspire people to get out and make improvements in their own lives. With the loss of my leg I have gained an incredible gift – the awesome ability to teach people that it doesn’t matter what challenges life has thrown at you, you can accomplish anything you want with determination and hard work. When faced with becoming unemployed early in the second year, the answer seemed obvious: give back by guiding, supporting and pushing others to overcome their challenges, discover their capabilities and give up their excuses. This year has also been about running. In August of last year, I set the goal to run a 5K. As an amputee the freedom running gives is incredibly powerful. Unfortunately, running was also very frustrating for me. I was more than physically fit to run, yet without the proper tool – a running blade – I found myself really doing nothing more than inflicting pain on my residual limb. Not wanting to give in, I reset my goal to return to running in the spring. As luck would have it, my motivation and push to get myself running came as a result of training a client. I promised this client that if he trained with me, not only would I get him physically ready to complete a Tough Mudder, but I would be right by his side running it with him. My challenge was twofold. 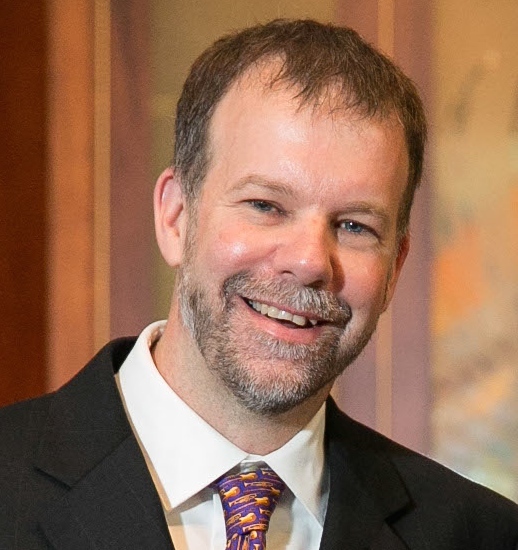 One, I needed to get my client ready to complete the Tough Mudder, and two, I had to figure out how I was going to run a 10-mile course without a running blade. We both put the work in, my client in the gym and me outside pushing through the pain, running, and adding a little length whenever my tolerance allowed. On July 24th we ran through the finish line at the Long Island Tough Mudder together. Today, exactly 2 years to the day later, I am in Nashville, TN, where I will begin my journey as a runner. 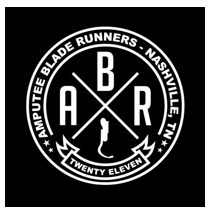 I have been given the incredible opportunity to become a member of the Amputee Blade Runners team. I am beyond grateful for this opportunity and humbled to be among these amazing ABR athletes. I spent the past two years building a strong, very capable body, and will now return home with the tool – the running leg – that I need to fully experience the power and freedom running will give me. So, what will year 3 bring? Training to run a marathon, another Tough Mudder, Ragnar Relay, triathlon training, 5Ks, jumping higher boxes, changing as many lives as I can in the gym as a trainer, and continuing what I do best – showing the world that life doesn’t end with amputation, and that you can in fact soar. Eight years ago I woke up each morning, swung my two healthy legs off the side of the bed and began my day. I didn’t give having two legs or walking a thought; I was just living my life like everyone else. My life was full, very busy and always active. When not at work I was playing with my kids, working on a home project and maintaining my yard to perfection. The highlight was spending the winter weekends skiing with my 3 kids. But life threw me a challenge! 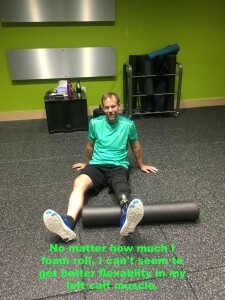 After six painful surgeries in an attempt to regain use of my destroyed ankle and six years of being in pain, unable to walk or do the activities I enjoyed, on September 24th 2014 I did the unthinkable – I had my lower left leg amputated. Within weeks of the amputation, I decided to take on the challenge of becoming a strong, fit and capable one-legged guy. I signed on with a personal trainer. Having the painful dead leg gone was truly liberating, and I now wanted to be pushed hard and given no special treatment. I had no idea what I would accomplish. I soon found that the more I challenged myself, the easier my daily life as an amputee became. 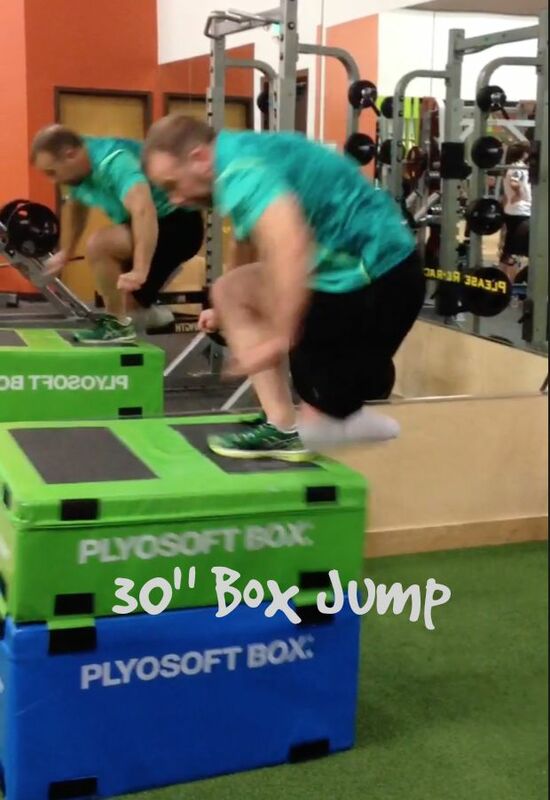 Before I knew it, with only my one leg, I was leaping on to 30” boxes, flipping 175lb tires, planking on two medicine balls, swinging on the gymnastic rings and signing up for physical challenges outside the gym that I had no idea how to achieve. With each one of them I grew into the person who could accomplish them and reaped the rewards of victory. I was now a one-legged man on a mission with no excuses and no limits. My determination to succeed physically in the gym gave me the power to take control of my life back. After 7 years of pain and suffering, I was active, strong, confident and loving life again. The most rewarding part of my fitness journey has been having the ability to inspire people to get out and make improvements in their own lives. With the loss of my leg I have gained an incredible gift: the awesome ability to teach people that it doesn’t matter what challenges life has thrown at you, you can accomplish anything you want with determination and hard work. So why do I do what I do? Today I wake up each morning, swing my one leg out of bed, put on my prosthetic leg and begin my rewarding day as a personal trainer. I don’t give having one leg a thought, because as my wife says, I am the most able person she knows. None of this happened by accident; I became a strong, confident, 100% able amputee by pushing and challenging myself through grueling workouts at the gym. I lost my disability and got my life back in the gym. Now it’s my turn to guide, support and push others to overcome their challenges, discover their capabilities and give up their excuses. I will help them discover how exercise can give them confidence, improve their lives and give them what I call the “feeling of strong”. I do it for my clients: a sixty-year-old who has spent the past decades taking care of everyone but herself and now fears for her mobility through her retirement years, along with an ex drug addict and a recovering alcoholic who signed on with me in search of healthier habits. I do it to help the young guy living with the challenge of Spina bifida improve his leg strength and balance, and to show a new young amputee in the gym, searching for his answers, that anything is possible. Today, working as a personal trainer means I spend up to 8-hour shifts on my feet. I am in constant motion, moving around the gym and demonstrating exercises. 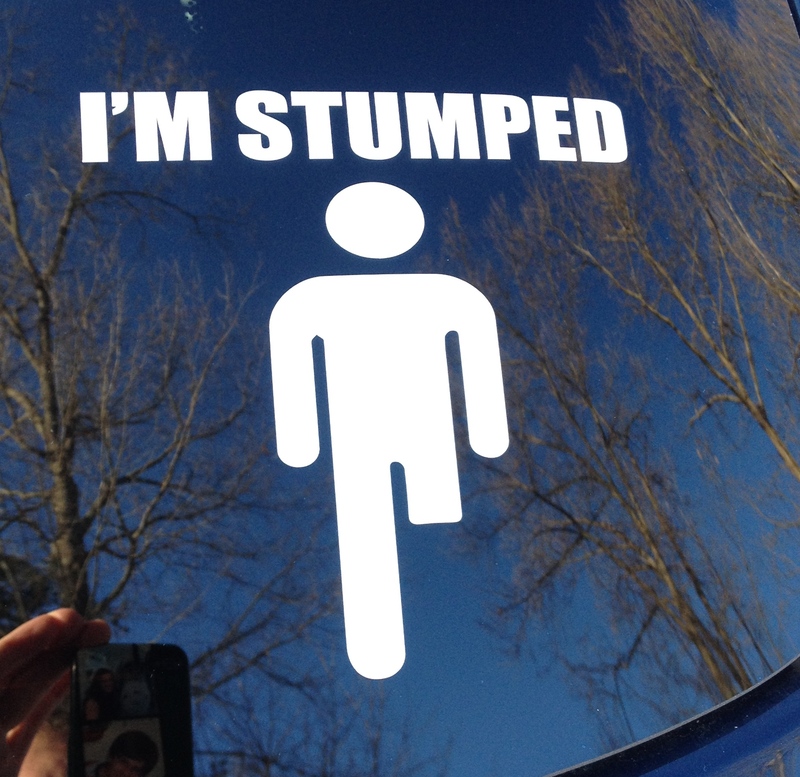 By the end of the day I can’t wait to kick my leg off and give my stump a rest. Yet I will take it, considering that three and a half years ago I gave up on an active life to settle for a desk job. What I have accomplished in the 19 months since amputation blows my mind every single day. If I can do it, anyone can. Take a peek into what a small part of my day is like. What is normal life? I am not sure anyone could really answer that question, and if they could it would mean many different things to many different people. For seven years I suffered unimaginable pain, endured 7 leg surgeries, wore many leg casts and was completely dependent on crutches for my mobility. I could no longer imagine what normal life was. I lost my career, my active life, and it seemed like life just kept crumbing down around me. For years I said to my psychologist, “All I want is a normal life, one with normal problems. I’m not asking for perfect, just normal.” In reality, I had no idea what that would be. Perhaps the life I had before the injury? All I knew was that living in pain, unable to use a leg and living from surgery to surgery wasn’t living a “normal” life. The seventh surgery was the amputation of my lower left leg. At that point I was no longer looking for a normal life, I was just looking for one without constant throbbing, mind-numbing pain. Besides, could I really ever have a normal life as an amputee? Would anyone really ever treat me normally? Would people always think I needed assistance? And my biggest fear, would people just feel sorry for me? I am happy and proud to say that 17 months post leg amputation, I have achieved a normal life. Yes, of course I am an amputee. 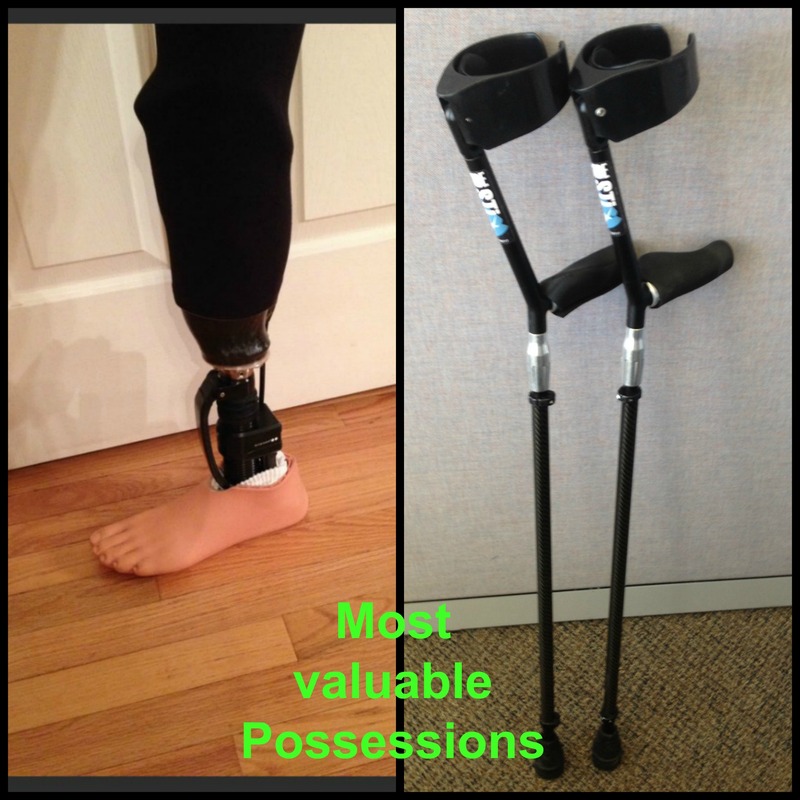 I am missing my lower left leg, I use a prosthetic leg and when not using the prosthetic leg I use crutches. Yes, I deal with donning a leg, cleaning prosthetic liners, adding/removing layers of prosthetic socks, skin irritations and prosthetic discomfort daily. And yes, every once in a while I think about how nice it must be to have two healthy legs, not needing a prosthetic or crutches to walk. Regardless, I have achieved a normal life. The following are the things that have allowed me to achieve what I call a “normal” life. First, I fully accept being an amputee. My stump has just become part of my body, while the prosthetic and crutches are the parts I attach to my body to give me mobility. I never hide my stump, I never hide my prosthetic, and I view my crutches as tools that help me, not symbols of disability. In fact, my crutches are my slippers. Just as you like to kick off your shoes after a long day and slip into comfy slippers. I like to kick off my shoe, kick off my leg and slip on to my crutches. Accepting being an amputee also requires being comfortable talking about it. I invite questions and conversation about being an amputee, and I constantly make jokes about it. The people who know me make jokes right back because they know it’s okay and I enjoy it. Fully accepting being an amputee takes being comfortable with your new body, being comfortable with having others see your stump and prosthetic, being willing to incorporate a back-up method of ambulation into your daily life, such as crutches, and having a willingness to openly discuss being an amputee with others. Second, I present myself as a confident and very capable person. Therefore, that is how people treat me. My fears of having people feel sorry for me and think I need assistance have not become a reality. They don’t think this because I give them no reason to. Whether I am using my prosthetic or my crutches, I present myself as a confident, capable person and that is how I am treated. Recently I had a conversation with a member at the gym where I work. We first met a year ago while I was taking an highly intensive exercise class. In the class I was not wearing my prosthetic, just hopping around one legged and conquering the moves better than the rest of the class. She said to me, “I never felt sorry for you, because you don’t give people any reason to.” Given this wonderful complement, how could I not feel I have achieved a normal life? Third, I became determined to live my life without limitations. There really is nothing I don’t do. In fact, I do more than what most healthy two-legged people do. I ask and accept no further assistance than anyone else would have or need. I made myself completely capable and independent by learning to do things one legged, with crutches or with the prosthetic. This way I never find myself disabled. I immersed myself into physical fitness and sport. Through my fitness workouts I’ve gain incredible balance, strength and endurance. This has resulted in being a confident and very capable person who can lead a normal life. Fourth, the thing that has most made me realize that I have truly achieved normal life is my new career. I work as a personal trainer at a very busy gym. I train people less than half my age with twice as many legs who aspire to do what I can. It is just mind-blowing! 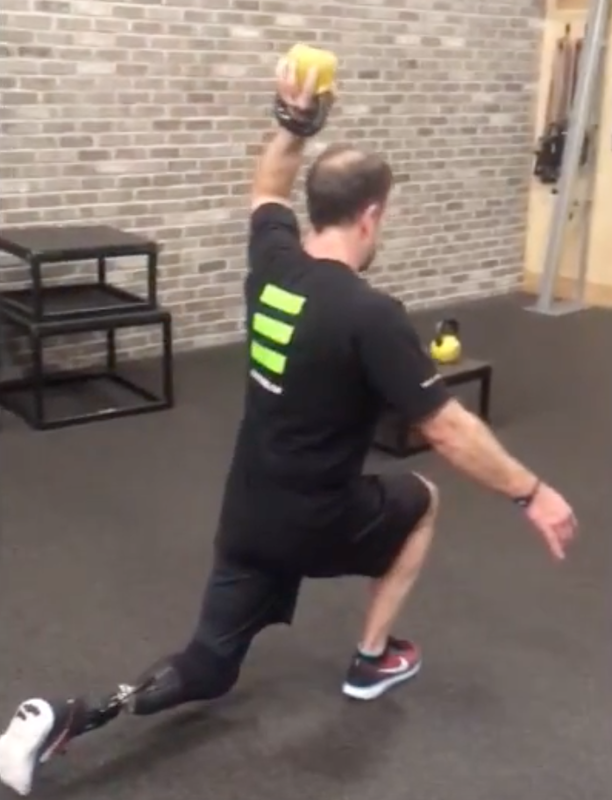 Each day I show up to work I am the only amputee there, however the only thing different between me any of the other trainers is basically “cosmetic” – my robotic leg. I work with trainers half my age and recently competed in a physical challenge with them. I didn’t win the challenge, but I didn’t finish last by any means. 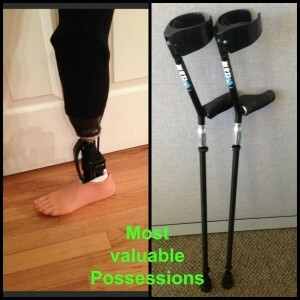 If the prosthesis is not seen, no one has any idea there is anything different about me. But I never cover it; I wear shorts every day and display being an amputee with pride. 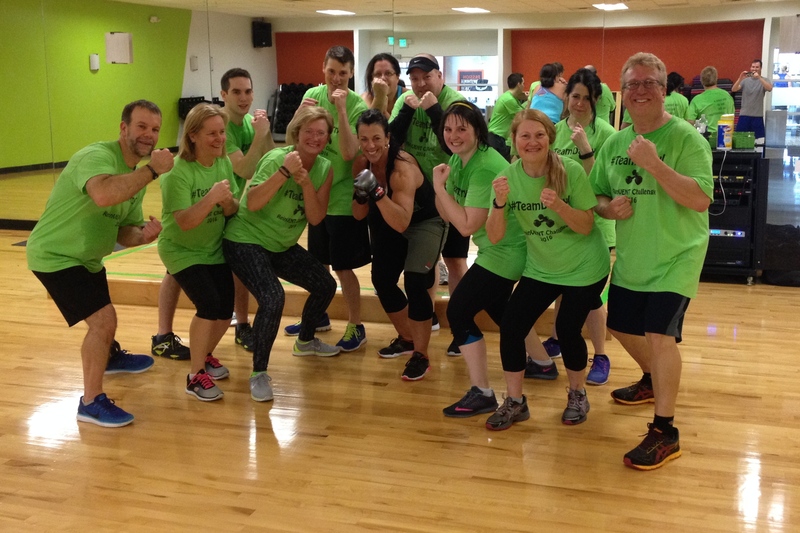 I do my job 100% with no accommodations, always present myself as a confident trainer, and there is no one in that gym – clients, supervisors or coworkers – that treats me one bit different or expects any less of me then they would anyone else. Yes, I am asked daily about how I lost my leg by clients and members, but that’s great as it shows I’m approachable and once again normal. I leap on 30” boxes, flip 175 lb. tires, perform 100 burpees in a row, all on one leg without my prosthesis. Wearing my prosthesis, I broad jump 7 to 8 ft, leap, skip and lunge forward, backward and laterally. While training clients and teaching classes, I tell one-legged jokes and often pull my leg off just to prove anything is possible. Yet, I walk through the gym, train clients and teach high-intensity metabolic classes, demonstrating each exercise, not giving being an amputee a thought with a feeling of complete normalcy. Me far left with my Challenge team. So what do I consider “normal” life? When after 7 years of sitting on the couch watching my wife and kids decorate our 13ft Christmas tree, this past Christmas, I climbed up and down the ladder without thought. When I hop out of bed, grab my crutches and begin my day without giving missing a leg or how I will get through the day a thought. I don’t need to, as I know I will conquer anything that comes my way. When the words ‘grocery store’, ‘Target’ or ‘school open house’ no longer send me into panic. I just get in the car and go. When I am out in the world doing my business and I have no idea if people are staring at my leg or lack of leg, because it’s the farthest thing from my focus. When I realize I no longer plan and worry about how everyday household tasks will get done – I just do them. When my daily stresses are about not having enough time in the day to accomplish everything that needs to be done as opposed to not being able to accomplish them due to my leg. When I realize I am doing a very physically active job and doing it no differently than anyone else. When I’m waiting in a line for our take-out and the guy next to me looks like I did two years ago (clearly in pain, having difficulty bearing weight on his leg), and I realize no one in the line has any idea I have a fake leg under my pants. 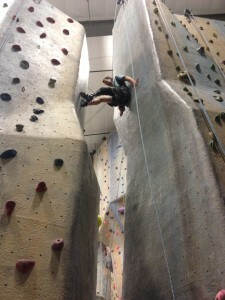 Accomplishing a normal life, as a leg amputee, did not come by chance. I don’t have any magical superpowers or super expensive high-tech equipment. In fact, I don’t even have a running leg. It took the strong desire not to be a disabled husband/father, an immense amount of determination, the hardest work I have ever done and never allowing myself to feel anything other than 100% capable. It also doesn’t mean life is easy. Living without a limb is not easy; I have just accepted the challenges and don’t make them the focus of my life. Instead, I focus on living life to the fullest and without limitations.